First Coin Company provides worldwide shipping via FedEx, UPS and USPS by registered and insured parcels. 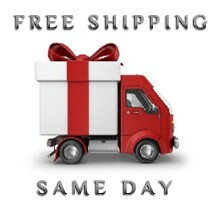 A “free shipping” option is available for some products (the free shipping option travels slower than any paid options). In all paid shipping options, the parcel’s weight, dimensions and destination determine cost. The cost of shipping is automatically added to your order according to the carrier's costs. Please, keep in mind, that shipping costs are subject to change at any time. Your shipment is sent fully insured and protected from loss by standard or express shipping methods. Please be aware that if you use a shipping address different from you billing address, to make sure your shipping address is correct. Also, please make sure to correctly specify your city’s zip code. In the case that an invalid delivery address is provided, the loss and responsibility for the shipment rests with the buyer. With the goal to provide the fastest service - in most cases - orders will be packed and shipped within 1-5 business days of the order being placed and payment processed in full (applicable when items are in stock). In case of pre-sale, pre-order or special order your package will be shipped as soon as we receive the ordered items into our inventory. Once your full order or some coins from your order have been dispatched you will receive a notification by email with the tracking details. If you add any paid expedited delivery, a shipping time will be active after we receive a coins from a mint.